APTAPTA is led by a group of professionals that have extensive practical experience in mature oilfield technologies. They also have a strong desire to keep the industry advancing and maintain a posture of innovative concepts and research. All of their research work, however, is intended to go to the field to be tested in commercial applications. 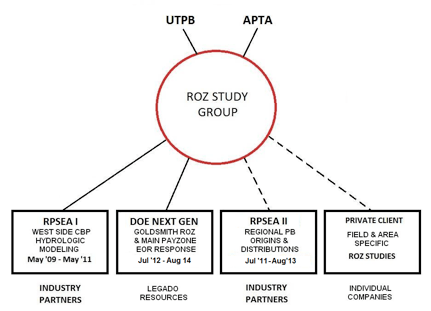 The research side of APTA can be best depicted in the graphic below. A very strong relationship is maintained with the University of Texas of the Permian Basin and its research center called the Center for Energy and Economic Diversification. Dr. Robert Trentham, geologist, Mr. Stephen Melzer, Geological Engineer and other key parties within APTA are working on research concepts together through APTA and UTPB.